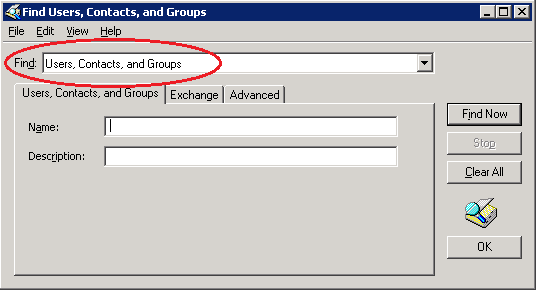 So, you need to make a custom address list (address book) for your Microsoft Outlook users with Microsoft Exchange Server 2003. This is one of those things where it's pretty easy to get what you want until you need a list with more than just one object type (users, contacts, groups, etc.). If you want an address list to include more than just one type, you'll have to do a custom LDAP query. Another reason you may have to do a custom LDAP query is if you want an "OR" in your conditional statement; in other words, you need to have an "either/or" condition (e.g., you want users who are part of either Group A or Group B). Next, open the Properties of the address list and select the Modify... button to create your query. By default, you will notice the Find: drop-down menu has Exchange Recipients selected. Go ahead and change that to Users, Contacts, and Groups. Now, use the three tabs to create a query for your list. If you don't need anything complex such as was mentioned earlier, you can use this tool to do your entire LDAP query for you, click OK and you're done. Of course, if that was the case, you probably wouldn't need this article. Chances are, you are going to need a more complex query. In that case, use the wizard to do just the first part of your query to get partial results, saving you from having to write the entire thing from scratch and producing a starting template for you to edit later. I recommend focusing on the third Advanced tab to get what you want. Click the Field drop-down button and start with your query for User, Group, or Contact. Then select your condition for that type. Users with a description field of "Consultant"
Groups with a description field of "Consultant"
Users who are members of a distribution group called "Smart People"
So, to start with, we will have the wizard create a LDAP query for just the first condition. On the Advanced tab, click the Field drop-down and select User -> Description. Change the condition to Is (exactly) and enter "Consultant" as your value. Finally, click Add to set this as one of your criterias. This is the part where I explain why we need to create a custom LDAP query rather than just use this wizard that Microsoft supplies. The issue we have is that if you try to add in another condition, it always interprets it as an AND type connection between it and the first condition. It's a shame Microsoft didn't program a simple drop-down that let's you select OR, NOT, etc. as well, but that's just how it is. So, we can't just add in the second condition of our example because that's a different object type (group vs user) or even the third condition because it would only show users who match both those conditions. Now, here's your basic LDAP query lesson. You'll notice that the query begins with a bunch of & symbols. This is your logical AND to combine your conditions. The syntax format is not If(Condition A)&(Condition B)as you may be used to, but rather &(Condition A)(Condition B). You can also have more than two conditions in the statement such as &(Condition A)(Condition B)(Condition C). This should help things make a little more sense as you look at the code. The other thing we now need to know is that the symbol for a logical OR is the pipe symbol |. That's about all the detail we need to get into at the moment. If you want a few more LDAP query basics, check out this Microsoft TechNet article. 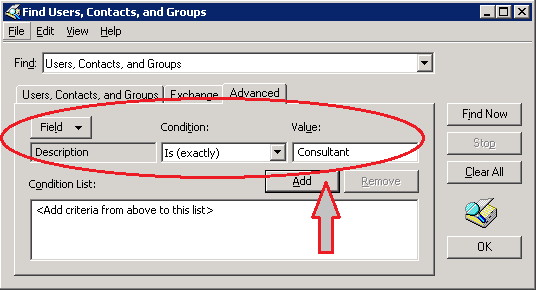 If you wanted any object with the description of "Consultant" and not just users or groups, you would simply have deleted the entire objectCategory section to remove that condition completely.Next, we will change the query again to add in our third condition: to include users who are members of a distribution group called "Smart People"
Again, we precursor everthing with an open parenthesis and added in the logical OR pipe symbol. Then we added our new condition (memberOf=cn=Smart People,ou=People,dc=MyDomain,dc=com) and then finished with a close parenthesis. When using the memberOf condition, you must use the Distinguished Name (DN). Finally, we need to take our modified query and use it in our address list. Hopefully, things aren't all that grim anymore!